The STEP HIV vaccine trial has been in the news a lot and it’s usually described as a “failed” trial. (I may even have described it that way myself.) It’s not really a failed trial, though; it’s a failed vaccine. The trial was successful in that exposed the failure of the vaccine, before the vaccine was widely deployed. Most failed vaccines are caught this way, assuming they even make it to the clinical trial stage. Even in the old days, before the present clinical trial/licensing system,1 most vaccines were highly effective and safe. I’ve shown stats about the truly spectacular effects of measles vaccine in the USA and in other first- and third-world countries, and I’ve shown what happens when anti-vaccine lies make people stop vaccinating (short answer: Children die). Anti-vaccine loons use all sorts of distortion and outright lies to deny these effects. But that’s not to say that vaccines have been universally perfect. There’s no doubt whatsoever that vaccines have caused harm. All but the very safest vaccines do have a detectable complication rate. Some have a relatively high complication rate — the vaccine against smallpox, vaccinia virus, probably had the highest complication rate of any widely-used vaccine (somewhere around 1/100,000 – 1/300,000 vaccinees had significant complications), though most vaccines are far safer than that. The smallpox case makes the point obvious, though, that it’s a cost/benefit analysis. 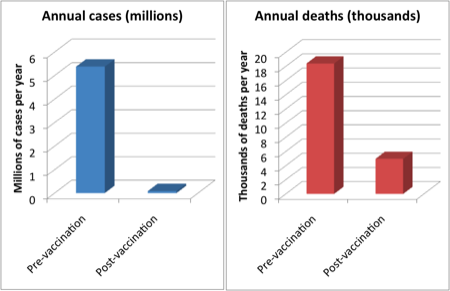 If vaccination can save a million lives, but costs ten lives, then most people would agree, however reluctantly, that vaccination is a good thing. 2 These vaccines are still successes. However, there are several cases of true vaccine failures. They don’t seem to be widely known — outside of immunology circles, of course, where they’re well-known cautionary tales — so it’s worth mentioning them. For one thing, these stories flatly disprove one of the most common vaccine-loon claims. The conspiracy theories claim that even though vaccines cause harm, the harm is ignored. Yet in these cases, when vaccines did cause harm — even in small numbers — the problems were quickly spotted and the vaccine was forced out of use. The polio vaccine contamination thing was in the early days of virology, in 1959. To make a long story short, the polio vaccine virus was grown on monkey cells which turned out to have a virus of their own. This is now known as simian virus 40, SV40, and is a well-known virus now, but that was the first time it was identified. 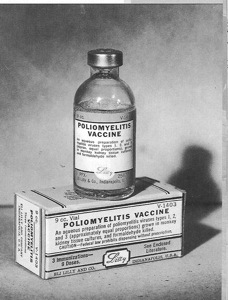 As it turned out, and mainly through luck, the SV40 contaminating the polio vaccine didn’t cause much, if any, disease in the recipients4 (though I’ve heard that immune-suppressed people, many years later, did have problems). It was a wake-up call to check much more thoroughly for unexpected passengers. The rotavirus vaccine is a more recent example. This was mainly a rare-problem case: A small number of children who received the vaccine had serious problems (intussusception), but the incidence was so low (between 1/10,000 and 1/30,000 recipients) that the clinical trials didn’t have enough power to identify it as a problem. When put into widespread use in the general population, the risk was quickly spotted and the vaccine was withdrawn within a year.5 (This is the counter to the loon’s claim that vaccine risks are ignored, by the way.) The newer rotavirus vaccines that were recently introduced don’t have this problem. Finally, that brings us to RSV, respiratory syncytial virus. This was the worst of the three, and the hardest to understand in terms of how the vaccine ever got licensed. To make this long story short, the RSV vaccine actually made the disease worse! RSV is a very common childhood virus, essentially infecting every child. Most have no problems, though because the disease is so common even rare complications in terms of percentages, turn out to be large in terms of actual numbers. But children previously vaccinated turned out to have much, much more frequent, and much more severe, complications. (Again, this was recognized and the vaccine was withdrawn, though I think it was not as quick as would happen today.) I’ll talk more about the RSV vaccine next time. This entry is filed under Science, Vaccines. You can follow any responses to this entry through the RSS 2.0 feed. Both comments and pings are currently closed.